Preparing to turn in my calculator means I can turn my attention to the next project. Build a Pomodoro Clock. This will require me to learn new things, like time-based anything and how to cause my HTML to emit sound. But like any other HTML/web project, the first part is figuring out what it will look like. Here is a screenshot of my Pomodoro Clock. Incurably retro. I got the idea from someone who mentioned they had a seven-segment font they were using for the calculator project and I thought how totally awesome that was for a clock. Now this font, being truly seven segments has no plus sign or colon. So the buttons (and the text) are in the Roboto font. which is how the real world deals with seven-segment stuff. Which is to say, they don’t use it except for the actual digital display. What you can’t notice from the screenshot is everything is in rem not px. This meant I had some artifacts and issues trying to make the actual clock part of the display work. I resolved them with Flexbox. You’ll find out more Thursday. Let me be blunt. The calculator is not a difficult project once you’re aware of the eval() function that takes a string and treats it as an arithmetic expression and evaluates it. If I knew the name of the person who mentioned it, I’d share. The trouble is, it was a toss-off comment in a reply to someone else and I happened to be paying attention. For the record, attention is good. I hang out in the gitter FreeCodeCamp room quite often and this sort of thing is there, going on all the time. Someone posts a problem, whether it’s with a challenge (“how do I nest my image element in an anchor tag?”), an algorithm (“can someone check my Roman number code?”) or a project (“my Twitch viewer shows the same channel eight times instead of showing the eight channels from my array”) and others offer help. Usually, the problem is spotted and resolved (often the person posting sees the issue as soon as they shared it). Someone else’s calculator issue was solved by eval() and I was watching. This was back when I was doing random quotes or something. 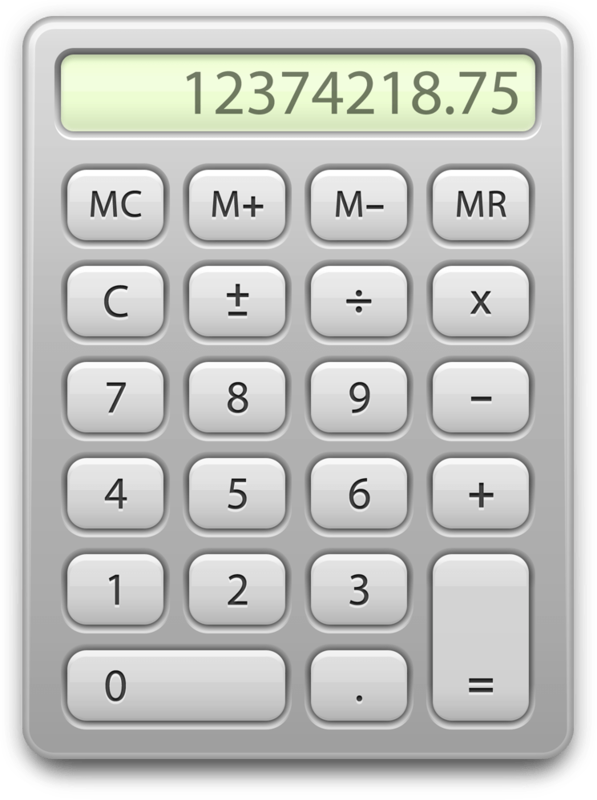 The difficult part of the calculator for me was how do I make something that looks like a calculator in HTML and CSS. The answer is by looking at someone else’s calculator. Google Images to the rescue. I found the OSX calculator icon. It has buttons on it for Clear and ± and memory management stuff in the top row that I don’t need. So if I delete the top row, I have a basic idea of what a calculator should have. If you look at it side-by-side with my calculator, you can see how it was inspired by this one. My phone calculator looks like someone was too lazy to bother making it look like it wasn’t an app on a phone. So using that as a guide would have given me something really ugly and not like the project was looking for. The colors for my calculator are courtesy of Computer Hopes HTML Color Codes & Names page. I found the red for that button as a trinary color for the blue of the other buttons. You can find trinary colors by typing or pasting the hex code for a color in the box at the top. I got the display box color by sampling the color from the OSX calculator and averaging it. It took a bit of trial-and-error to get good button colors with my faceplate color. But that’s only part of it, there are also fonts. For the display, I wanted a font with something in the zero. A slash or dot or something. But not for the buttons. Zero on a button should look empty and the C should look reasonable. So I hit up Google Fonts. I specifically typed in the digits and the key signs (so I could see what the keys would look like) and told it to make that be the sample for all of the fonts. Then I said I only wanted monospace fonts. And alphabetical because I was looking for specific things, not popularity. The fonts I chose were Abel for the the keys and Allerta for the display. I liked the look of the C in Abel and the fact the 4 was closed. So, on to making it function. I’m sure there’s a better way—there always is—but what I did was made a click event for each button and then handled it. For the digits, it was easy—check if the the entry was zero—if it was, replace it with the number, otherwise, add the digit to the string for the current number. Decimal point was tough—you can only have one per number. And signs meant I had to peel off the current number and make a new one. And then the equals meant, run eval(). Okay, that all worked so I took it to gitter. And someone said it didn’t “chain”. Now, I could type 2+5*4 and press the equal sign and get 22 so I knew it worked. But that wasn’t what they meant. They meant, if I pressed equals again, it should repeat the last operation so I should get 88 (22 * 4) the next time, and so on. While I was fixing it, we got into a side conversation about how I don’t generally use a calculator so I was unaware of that expected behavior. Then, right when I had typed “try it now” they typed, “don’t worry about it, mine doesn’t do that, either,” and I had to laugh because, well, mine does it. It’s still on CodePen but will be moved to GitHub before I turn it in. The links on the right will always be current.